Cattleya orchids are often called the corsage orchid. They come in a wide variety of colors and shapes which can easily be adapted to make tiny miniature versions for a dolls house conservatory or a miniature corsage as is shown here. Variations of this one plant were often collected by orchid fanciers, so you can fill a miniature conservatory, greenhouse or dolls' house using just this one plant. To make miniature orchids in a scale to suit your miniature scene, you can cut basic petals by hand from lightweight paper, or modify petals cut using a paper punch as I have here. The distinctive shape of the cattleya orchid is different from the miniature phalaenopsis orchid. A similar method to the one used for making the miniature phalaenopsis orchid can be used to make leaves and stems for the cattleya. If you want to reproduce miniature plant versions, you will need to use wider leaves and bulbous stems, like the ones shown here in an introductory article on growing cattleya orchids from the American Orchid Society. I've shown the miniature cattleya orchid flowers made from paper, but you can use similar techniques to make them from polymer clay or cold porcelain if you prefer. I used a paper punch of medium sized rose leaves for the basic shapes for my orchid petals. The largest petal is roughly 1/4 inch (6mm) across which works out fine for 1:12 scale. If you want to make larger or smaller orchids make larger or smaller petals in roughly the shapes shown in the tutorial. You can also cut petals easily by hand as you need only two shapes, slightly rounded, and narrow ovals. Lightweight air dry clay (like Delight) and watercolors or acrylic paints in green leaf shades if you want to make your orchid into a plant. The lip petal of a cattleya orchid (the main curved petal on the bottom) is the largest orchid petal. To make mine, I've cut the largest petal free from my set of rose leaves, cutting just at the base of the petal to make it rounded. The pointed end will be used to make the center of the orchid flower. (see next step). The petal is shaped by pressing the embossing tool gently into the petal edges on the round end and sides, then using a slightly larger embossing tool to shape h petal into a cup shape. The center of the petal is colored yellow to make the throat of the orchid. Most cattleya (corsage) orchids have a yellow throat. If you want, you can color your orchid petals to make different colored blooms. I'm showing a white orchid as it is the simplest to make. The center of cattleya orchids ​has a small lip or 'anther cover' above the throat of the lip petal. To mimic this in a dollhouse miniature orchid, I've glued a small round ended section of paper to the end of a wire 'stem' for my orchid. The paper piece I used was cut from the pointed end of my petal. The yellow throat of my lip petal is left touching the end of the newly trimmed petal. Once you have the lip petal trimmed and shaped, you can glue it to the wire stem. Apply a bit of glue to the wire stem in back of the 'anther cover' and set the flat end of your lip petal around the wire so the base of the lip petal covers half the top of the anther cover. Now wrap the other side of the lip petal around the wire stem under the anther cover and glue it tight over the anther cover to make a lip petal that is tight to the stem over the anther cover and flaring to the lip of the orchid. (see photo). The next step in making the cattleya orchid miniature is to shape two side petals. The side petals should be the same rounded shape as the lip petal but slightly smaller. I cut mine from the second largest petals on my punch out. This will depend slightly on the variety of cattleya you are trying to reproduce. Some have petals that point up, some have narrower petals, wider petals... Whenever possible work from a photo of an actual flower. With the two side petals shaped, glue the pointed or thinner ends to the wire stem behind the lip petal. The three petals (lip and two side petals) should be set like the arms and base of a " Y" . Set the orchid aside to dry while you work on the narrower ' sepal' petals. The sepals on a cattleya orchid are the narrow petals that are located on the top center, and flanking the bottom lip petal. These are always narrower (and usually simpler) than the three main orchid petals. To make sepal petals from my punched petals I used the smallest leaf and trimmed it with curved scissors to make a simple oval with a slight point on the end. You will need three of these sepal petals for each cattleya flower. With the orchid flower 'face' turned away from you, glue two of your narrower sepal petals to the stem of the orchid flower, so the sepals angle out from the sides of the lip petal. The sepals can be out slightly farther than the lip petal if you wish, or they can be roughly the same distance out from the stem. Glue them neatly to the back of the stem. I dip the ends of my petals in glue or you can dab a tiny bit of glue onto the wire stem, then fit the petal in place. The final sepal petal for the miniature cattleya orchid is fitted on the stem between the two upper petals. The sepal petal will be at the top of the orchid flower. To make a traditional corsage from your dollhouse miniature orchid you will need to make one or two small ribbon bows which suit the delicate look of the orchid. I used bows made from the wired edges of a wider organza ribbon. Try to make bows from ribbons which will complement, but not take over from the color of your orchid. For a corsage, cut the orchid stem off close to the back of the flower, leaving no more than 1/8 inch (3mm) of stem. Apply a bit of glue to the end of the stem to hold the paper wrapping on the wire. If you want to make a miniature bouquet, you can use the orchid as the central flower in a ribbon bow or follow the same instructions used for making miniature rose bouquets. 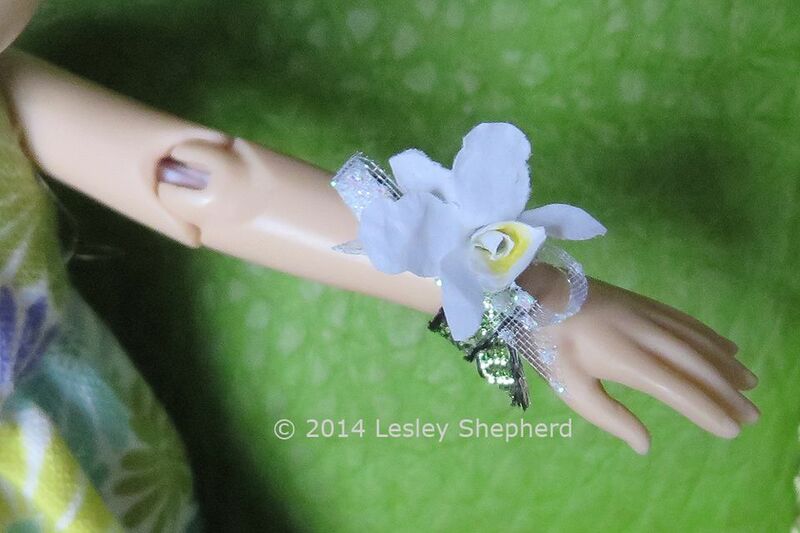 The wrist (or purse) corsage is the easiest to make and the easiest to show off in a dollhouse setting as you can position a doll's hand for the best display. Corsages of this type can also be displayed in small florists boxes made from lightweight card or heavy paper with a cellophane cutout in the top. (see the printable French bakery boxes for a similar style of box). To make the wrist corsage fit a doll, tie a bright piece of ribbon around a doll's wrist so the knot is on the top of the wrist. Glue one or two small bows to the sides of the miniature orchid flower, gluing them to the base of the flower rather than the petals. Allow the bows to dry in place on the flower. Apply a small dot of glue to the knot area of the ribbon on the doll's wrist and carefully set the orchid onto the wrist ribbon (or purse ribbon). Hold the flower until the glue starts to tack. Allow the assembly to dry. See the finished wrist corsage on the first page of these instructions. Set the orchid in place of the miniature roses in the bouquet top (or with miniature roses if you wish) and add a small bow below the orchid. Trim the ribbons wires and sew a few stitches through the back of the corsage and onto the doll's costume, or set a small piece of doll velcro on the bouquet and a matching one on the doll. Expand your orchid collection with as many varieties as you wish. Have fun!